You have been working as a freelance blogger for years. You have worked with different clients from various industries. There are some who have made your life difficult, but you overcame.Â There are others that helped make you a successful blogger. But life as a freelancer is never the easiest road to take. Clients come and go. There are no guarantees with the amount of work, and payment can be problematic. There are some who pay more than enough and others who run away with your work.Â You then find yourself looking for new clients. This is the cycle that most freelancers undergo to support their livelihood. It may not be the most secure job in the world. But because the passion for blogging is there, we move forward and roll with the punches. But there is a way toÂ develop a sustainable blogging career.Â You need to learnÂ nurturingÂ relationships with clients new and old. There is a tendency among freelancers to treat clients as a job. While this may be true, appealing to their sensibilities is a skill that you need to develop. This allows you to build strong relationships with clients so they can offer you more jobsÂ in the future. If you combine thisÂ with your strong blogging skills, you will not have to scrambleÂ for new work all the time. You can start by reaching out to your old clients. It may have been years since you last spoke to them or had a project together. But this is your chance to reconnect and make the most out of your career as a blogger. If you are intent on getting your old clients back, you need to gain their interest back to your services. Below is a simple guide that you can launch within the next 10 days to get at least a reply from them. This approach can be time-consuming. But there is an easier method that allows you to keep all your information within Gmail. Download and use Streak. It is a CRM app that runs with your Gmail account. You can label your clients as boxes and fill out their informationÂ there. Another simplified method of getting all their information from your inbox is Sortd. This is a smart skin that turns the old Gmail layout into a project management tool. Create specific labels from the skin and arrange the emails into the right label. You can turn Sortd like a sales funnel. Create labels that flow like your conversion funnel (leads, negotiation, closed, etc.). You can drag and drop the email threads on the appropriate label. Compose an email to your old clients that letÂ you touch base with them for a new job. You might remember me as the blogger who worked with you on the project. ItÂ wasÂ [describe project details here]. I just want to let you know that I am available for work. Let me know if you want to work with me again. Thanks! Familiarize yourself with the client – You had a working relationship with this person. This gives you the advantage over other bloggers looking for work.Â This could work against you ifÂ your previous project with the client did not end well. Showcase your new work – Send over URLs of blog posts related to the niche of the clients. You can include a description for each post to increase click-through.Â This will increase the chances of a replyÂ from them. Casual tone – Do not beg for work. Do not twist the arm of the client into taking you in for a job. Do not approach the client with a formal tone. You want to keep your email loose and relax. The client is not obligated to give you a job. You can edit the email as you see fit. Make it as personal as possible to increase chances of getting a reply. IfÂ you have not received any reply from them, you need to pull out an ace in your sleeve. This is by linking back to their sites in one of your blog posts. This could work if you receivedÂ a negative letter.Â You want to take this opportunity to make them change their minds. If you are writing for different blogs, you can sneak in a mention of their product or services. Make sure that the mention of theÂ potential client is in good taste and does not look spammy. If the client product or service does not fit in any of the blogs, you can just write on your own blog. Make sure that your blog has enough clout to justify your post featuring the client. Tip: You can refer to the Domain Authority (DA) and social followersÂ of your blog to determine its clout. The DA is an algorithm developed by Moz. ItÂ computes relevant website factors for its score. You can get the DA of your blog by heading to Open Site Explorer and entering your blog URL. You will see the DA on the next page. The higher the DA, the more authoritative your site is in the eyes of search engines. Social followers refer to your Facebook fans and Twitter followers. The more followers you have, the more chances that they will share your post. If you are not confident with the clout of your blog,Â submit a guest post in these sites instead. This may take a lot of time to publish and may take more than 10 days. But once the site publishes your post, you can use this as a tool to build your relationship with the client. Send them an email with the publishedÂ post. Here is another basic email template you can use. I haven’t heard from you since I last emailed you. I can write more posts likeÂ the one aboveÂ for you. Hope to hear from you soon so we can discuss details. This email template follows the approach of the first email you sent. It does not impose your desire to get a job from them. Instead, you prime yourself to earn a job from them because of the post you write. Even when they have yet to do something for you, you took it upon yourself to do something for them first. Doing someone a favor refers to the concept of reciprocity by Robert Cialdini. According to the idea of reciprocity, this can lead us to feel obliged to offer concessions or discounts to others if they have offered them to us. This is because we’re uncomfortable with feeling indebted to them. Because you did something good for the client, this will compel them to reply and repay your deed. If they still do not reply to your email, then you need to go with your last resort. Offering a discount is something that you should not send out to all your old clients. You do not want to blog and get less than what you deserve. Only send out the discount to clients that have replied back but are still undecided. Use the discount to close the deal and secure the job with them. I understand that you are yet to make up your mind about hiring me for another project. To help you convince that I am the right person for the job, I can offer you 20% off for my blogging service. Let’s come up with an agreement soon so we can make awesome things together! I took liberties in the last paragraph, but I hope you got the point. The 20% discount is arbitrary. You can come up with a reasonable number on your own. Just make sure that it is good deal that will guarantee a job from your client. Also, I used an exclamation point in the last sentence. This is to share the excited sentiment and to send the positive vibe to the client. These little things can help decide the minds of your client in a big way. Aside from a discount, you can offer something else in return. You can lend tools or resources that can help with your project. For example, if you have a paid account for a stock photo site, you can send a certain amount ofÂ images to them. Come up with unique ideas for resources to offer. Final thoughts:Â The process of getting jobs from old clients is simple.Â But it takes creativity and know-how to make this work. The steps illustrated above will not work all the time. 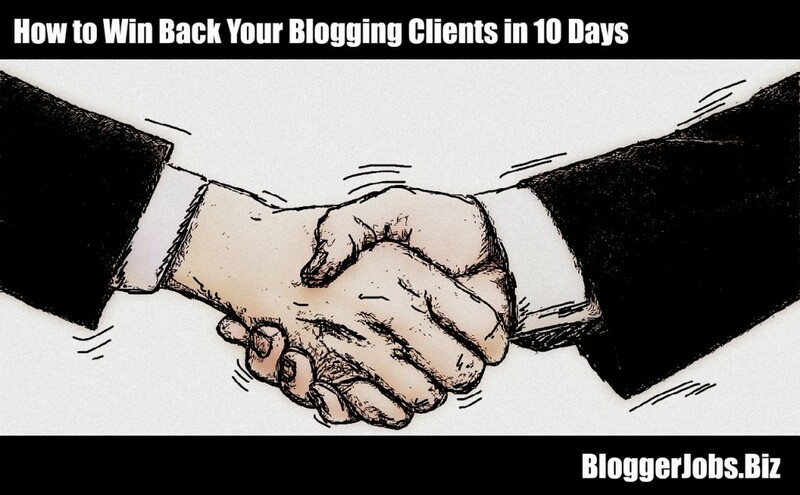 There will be clients who will not reply back even after you have featured them in a blog post. This should not stop you from turning your old relationships into job opportunities. Instead of ignoring yourÂ old clients, youÂ can squeeze a job out from them following the steps above.